The hobby of radio control flying is a fast-changing one these days, and FPV flying is a relatively new discipline that's come about as a result of the electronic and technological revolution that has changed the face of the hobby in the last decade. FPV stands for First Person View, or sometimes but less commonly First Person Video, and is a way of flying a radio control aircraft while having a pilot's eye view i.e. flying it as if you were sat in the cockpit. 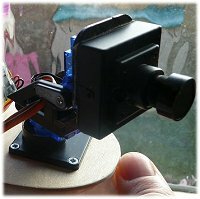 Incidentally, this page isn't intended to give a technical breakdown of FPV, but more of a general overview to perhaps whet your appetite! So dreams can come true! Way back in the early 1990s when I was flying glow plug powered planes at a local club, I used to think how cool it would be to fit a video camera on my plane and have the footage broadcast to a television, around which was built a mock-up cockpit with a full-size yoke and pedals. 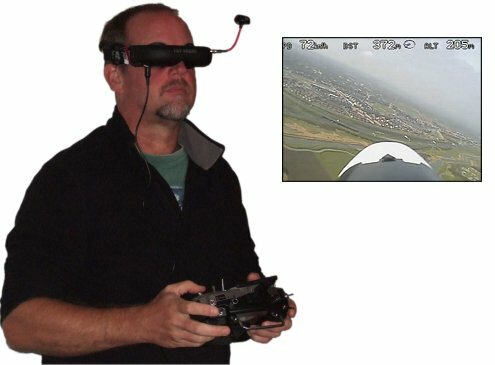 Rather like a full size flight simulator, but for flying a radio control plane with a real-time view from the cockpit. Back then that was a completely unrealistic fantasy, but just a decade or so later small video cameras had found their way into the hobby and were being fitted to model aircraft for aerial video fun. It was only a matter of time before that pilot-eye view while flying my plane became a reality, and who could have guessed that such technology would become so widely available and so miniature! Horizon Hobby's FPV Vapor is an example of what's been achieved in a short space of time. has made FPV flying very easy. It's been the increasing availability of small, light and cheap video security cameras that have really given FPV flying a foot-up, coupled with small and lightweight video transmitters. The video signal is transmitted to a receiver and so the real-time video feed can be viewed by the pilot either on a video monitor or video goggles . Using goggles gives the pilot a much more immersive experience, since all outside references are shut out. He/she only sees what the camera sees, whereas a monitor will always let some degree of peripheral vision be a potential distraction. Above: your video viewing options are monitor or goggles. The camera, obviously mounted on the aircraft, can be fixed (i.e. pointed in one direction) or can be attached to a Pan and Tilt (P&T) gimbal so can be moved around, either by manual operation of a TX stick/dial or by head tracking, whereby movements of the pilot's head moves the camera gimbal. Obviously this latter option only works with goggles and not a monitor. My personal choice is the FatShark Attitude goggles which feature the Trinity Headtracker. There are some basic ingredients to an FPV setup. As just mentioned you'll need a camera and video transmitter along with a method of viewing the video feed - either a monitor or goggles. If using a monitor you'll need a ground-base to run it on, whereas goggles are simply worn like, erm, goggles. You might or might not want to record your video, in which case you'll need some kind of recording device. The better goggles and monitors might have built-in SD card capability for recording. Otherwise it's a standalone device that connects by cable to your monitor or goggles. The antennas come in a few different shapes, with the standard (straight) and circular ones being most popular. Without going in to the technicalities, the circular antennas perform better due to the way the signal is transmitted and received. A safe option is to buy everything as a package, such as the aforementioned FatShark Attitude set, as this ensures compatibility of all items. The other option is to buy it all separately, but care must be taken to ensure that all the bits will work together. The online forum FPV Lab is an excellent resource for information and help should you need help and advice from seasoned FPV'ers. If you want a more comprehensive viewing experience than just the basic pilot's eye view, you can opt for an on-screen display, or OSD. This electronic gadget connects between camera and video transmitter and provides useful, and perhaps sometimes gimmicky, flight information. The information is delivered to your monitor/goggles and can include trip distance, distance from home, speed, altitude, climb and descent rates and maybe even an arrow to show you the way home if you get lost. Most of this information comes from GPS capability built into the OSD unit, so if you opt for an OSD without GPS then the information will be much more limited. 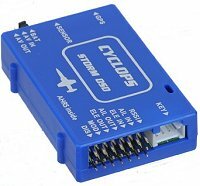 A very beneficial feature of good OSD units for FPV flying is the Return To Home, or RTH, feature. This, quite literally, means that the aircraft will return to home (i.e. its launch point, or very close to it) once this feature is activated by the pilot. The RTH works by the OSD unit storing the launch point co-ordinates (thanks to GPS) acquired when the unit is initialised, and taking directional control of the model to fly it back to those co-ordinates when RTH is activated. Obviously for this to work, the OSD unit has to be wired in to the directional controls of the aircraft - in the case of a plane, this will be aileron/rudder and elevator. A safety height can be programmed in so that when the aircraft does return home, it will circle at that height until RTH is deactivated and the pilot can land manually. It's common practice, where possible, to program the RTH to kick in as a TX failsafe feature; in other words if the radio signal from transmitter to model is lost then RTH automatically activates and the aircraft will not fly off in to the great blue yonder, but instead come home to its owner. 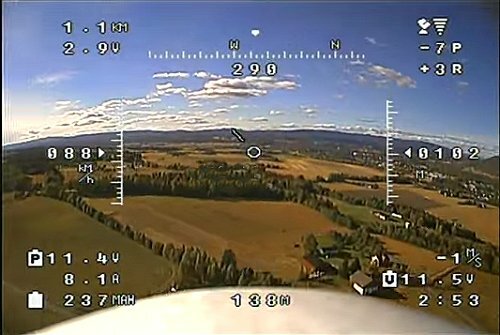 There are essentially four frequencies used for FPV flying: 900MHz, 1.2GHz, 2.4GHz and 5.8GHz. Which one you choose will depend on a few things, and each one has its pros and cons. 5.8GHz seems to be the common choice but it's always best to check which is best for your situation and country. Again, for some solid advice on which is best for your needs visit the FPV Lab online forum. A good FPV platform needs to be stable and ideally not too hard to fly. My personal choice was a powered glider, a Hobbyking Bixler2 in fact. This is a low cost foamie with a fairly good reputation for both a beginner's plane (although I'm no beginner!) and an FPV platform. You can read more about my Bixler here. A powered glider type airplane is a good choice because they generally have a good wing area and are nice and stable in the air. Incidentally, I also put an FPV camera on my ParkZone Radian Pro simply because I had a spare camera kicking about. Of course, FPV setups have found their way onto non-glider type planes, such as flying wing types, but it just depends on your personal preference and what you want to do. For me, taking in the view while gently ambling about the sky at a slow speed keeps me happy, so a powered glider is fine for my needs. The other very popular aircraft type for FPV flying is of course the rc drone . Personally I prefer to stick with the more accurate name of multicopter but the name drone does seem to have found its way in to the radio control hobby in a big way recently. Love 'em or hate 'em, multicopters/drones are ideal for FPV flying because they are relatively easy to fly, even with no experience, and they are very stable thanks to the advanced stabilisation technology used within them. Personally I'm not a huge fan of the things, and to be honest they have given our hobby some bad publicity thanks to some irresponsible, or possibly just naïve, people flying them. But this type of aircraft has changed the face of the hobby in recent times, albeit at the cost of conventional planes and helicopters having to take a back seat in terms of popularity. Darn shame really. OK, I do own an E-flite Nano QX which I've had some micro FPV fun with, but that's as far as my interest in them goes! So whether you opt for a conventional rc plane or a multicopter, FPV flying is a lot of fun and very rewarding but you do need to be a competent and confident rc pilot first. If you are new to the radio control flying hobby and are interested in rc FPV, learn to fly to a good standard before you don the goggles! On that note, please check out my two popular e-books. As I mentioned earlier, our beloved radio control flying hobby has suffered a small amount of bad press since "the rise of the drones". The sudden increase in multicopter use for aerial filming has thrust them into the public and media spotlights, and while FPV flying with a plane or powered glider is quite common, it is the increased use of multicopters which has drawn a small amount of negative attention. The primary reason behind this is that multicopters capable of carrying a camera - and even multicopters that come already equipped with a camera and viewing system - can be bought and flown by someone with very little or no prior radio control flying experience. In contrast, it's not as easy to buy an airplane/glider and have a successful first flight with it, and then do some FPV flying on the same day. So, then, Joe Public can buy an FPV-equipped multicopter, charge the battery and then go FPV'ing all within a few hours. While this is good for bringing new bodies in to the radio control flying hobby, and hence opening their eyes to the thrills and attraction of this exhilarating pastime, it's not good because that same Joe Public doesn't have a clue that the hobby is regulated. As far as he/she is concerned, these flying camera things are just cool toys and can be flown anywhere. Unfortunately it's this ignorance of the radio control flying laws that have led to some nasty incidents with camera-equipped multicopters. As a result of these incidents, and invasions of privacy etc., governing bodies around the world have had to bring in new rules and regulations to try and prevent the irresponsible and potentially very dangerous use of such rc aircraft. So if you are new to the hobby and are thinking of doing some FPV flying, it's absolutely imperative that you investigate your country's laws for radio control flying in general, but particularly the rules for FPV. Such rules are obviously going to differ from country to country, but here in the UK the current rc FPV flying rules, as laid down by the CAA and BMFA, and at the time of writing this page, can be found at http://www.caa.co.uk/docs/33/1108.pdf. For other countries, look at your governing national body's website for model flying, for example the AMA in the United States. Links to other countries' governing bodies can be found on my rc plane clubs page. In short, don't go buying an aircraft with the intention of doing some FPV flying, without knowing what the rules and regulations are for flying it. People have been successfully prosecuted for illegal flying of such aircraft, whether knowingly or not. 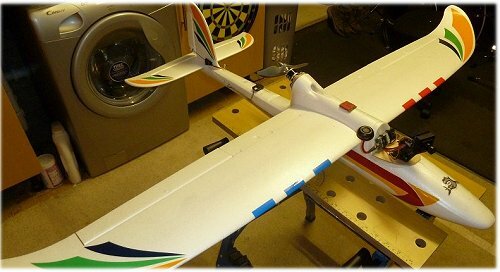 See my Bixler2 FPV conversion.